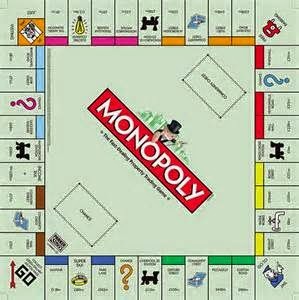 On the 80th anniversary of the Monopoly board game going on sale, a UK national newspaper has devised a Monopoly pub crawl, featuring a different venue for each of the 22 coloured properties. I thought I would share the newspaper's recommended ale houses with readers, but just don't try to visit them all in one go. 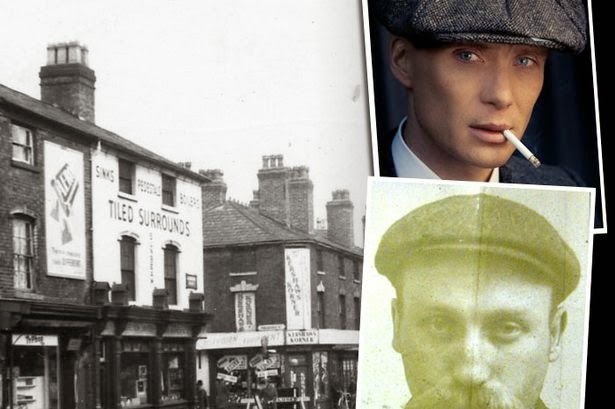 The location is hardly pretty – hemmed in by traffic-clogged roads and department stores – but this Victorian pub has plenty of history, having once been considered the “spiritual home of British boxing”. Henry Cooper trained upstairs for more than a decade, while Ali, Frazier and Sugar Ray Leonard all sparred here. Following a recent refurbishment, it now serves cocktails and South American-inspired food. 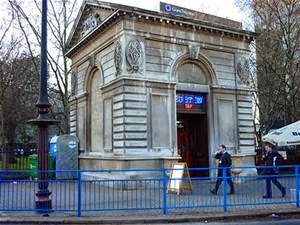 Best known as the bar where Ronnie Kray murdered George Cornell in 1966, the Blind Beggar was also the site of William Booth’s first sermon, which led to the creation of the Salvation Army. Today it has a comfortable interior, large garden and serves posh hot dogs. For a more substantial meal, to fortify yourself for a long day ahead, nearby Tayyabs serves seriously good Punjabi cuisine (the lamb chops are a must). 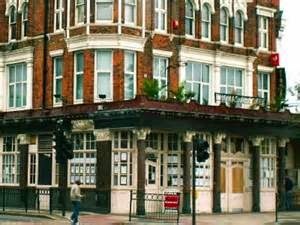 An ever-popular boozer just south of Angel tube station, it hosts live music and a range of diverse football-themed activities, from Subbuteo tournaments to “sticker swapsies” events and “comedy commentary” – where loose-lipped punters are given a mic to describe the big game. It’s also renowned as a theatre pub – an intimate room upstairs seats 60 for fringe productions. Fill up with a giant bowl of noodle soup at Pho, on Upper Street. There are a few options on Euston Road. Cider lovers should seek out the Euston Tap, with its wide range of still ciders and perry "served straight from the oak"; The Rocket, a large, lively pub that draws a youthful crowd, is another decent bet; and the Good Pub Guide recommends the Euston Flyer ("big and welcoming, with real ales and photographs of old London"). 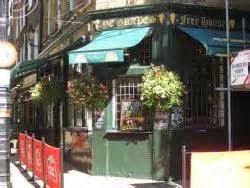 It's easy to miss this decent little boozer, hidden around the corner from busy Upper Street and Chapel Market. The interior is smart, with wooden floors and a couple of cosy corners, but the biggest draw is the roof terrace, making it a great option during summer months. A good range of burgers, steaks and salad are on offer. 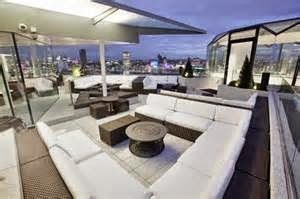 Another good option, also with a big roof terrace, is The Big Chill Bar near King's Cross Station. We're approaching the more lucrative properties now, and next up is this boutique wine bar and shop hidden in the Royal Opera Arcade, which links Piccadilly and Haymarket. The decor is charming - great wooden barrels serve as tables - and the wine list eclectic. Mop it all up with salami and burrata. There are a few options at the northern end of Whitehall, including this characterful little Victorian pub clad in wood and with real ales behind the bar. There are few sleeker spots to enjoy a cocktail than the Bassoon bar at The Corinthia. It hosts live music most evenings - the likes of Lana Del Ray and the Scissor Sisters have even preformed here. For something a little easier on the wallet, try the smart, airy Boyds Brasserie, at number 8. On to the orange properties, and the no-nonsense Marquess of Anglesey. 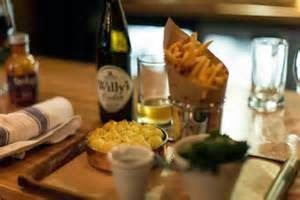 There's real ale on tap and sausage and mash on the menu - what more do you need? The story of the first Marquess of Anglesey - after which the pub got its name - is rather more notable. He was shot by a cannon at Waterloo, necessitating its amputation. According to legend, he was close to Wellington at the time, and exclaimed, "By God, sir, I've lost my leg!" — to which Wellington replied, "By God, sir, so you have!" This handsome little Art Deco bar has panelling, mirrors and smart brass fittings, and is discreetly hidden beneath an equally good-looking brasserie. There are a range of classic cocktails available, along with a good selection of beers and ciders, including such as Gentlemans Wit wheat beer and Hawkes alcoholic ginger beer. With no decent options on Vine Street, seek out Minories, which runs parralel to it. There you'll find Abbey Bar, an eccentrically-decorated bar, with wooden floors, quirky artwork, and a menu packed with gastro-pub favourites. On the tenth floor of the ME London hotel, which opened in 2013, Radio features some of the best panoramic views of the city, with Tower Bridge, the Shard, Somerset House and the Houses of Parliament all visible. It's smart, with DJs playing most nights, but also pricey, with cocktails from around £10. For something more down-to-earth, the Good Pub Guide recommends The George, a timbered pub with nine real ales not far from the law courts. On every list of historic pubs in London and with reason: the warren-like Ye Olde Cheshire Cheese is an absolute treat. Countless literary grandees and journalists – from Samuel Johnson and Dickens to the Fleet Street hacks of the 20th century – have occupied a nook or cranny in its labyrinthine interior. Although very much on the tourist trail, it is big enough to cope. Rebuilt in 1667 after the Great Fire – a date flagged boastfully on the sign outside, it’s another Sam Smiths pub – cheap, but not a great beer selection. Oh, and if you find yourself in one of the cellar bars, you won’t get a mobile phone reception, completing your escape from the daily grind. 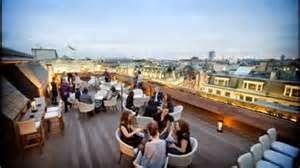 More cracking views can be found at the rooftop bar of The Trafalgar hotel. It's expensive - few hotel bars aren't - and open from noon till midnight (Mon-Sat), or until 11pm on Sundays. Access is subject to weather conditions so check the forecast before heading down. 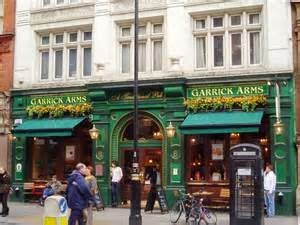 Avoid the area's chain pubs and head instead for Garrick Arms, just west of Leicester Square. 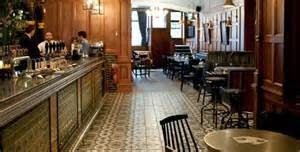 It was recently refurbishment, there are real ales, and despite the location, you can often get a table. Cafe de Paris, which hosts cabaret evenings, is Coventry's Street most eye-catching venue, but pub crawlers will need to look elsewhere. The Comedy Pub on Oxendon Street is a classic Victorian boozer with a stand-up venue upstairs. The Tom Cribb, a few yards farther south, and named after the English bare-knuckle boxing champion, is just as unpretentious and reliable. An understated entrance just off Piccadilly Circus hides stairs that sweep down to a cavernous French restaurant and bar, with all the bustle, marble and gilded mirrors that you would expect from a respectable Parisian brasserie. The atmosphere is Saint Germain, the food surprisingly affordable. The bar has plenty of Forties glamour, classic cocktails and lots of seating. In the former Dickins & Jones department store on Regent Street you'll find Aqua Spirit, another of the capital's best rooftop bars. The theme here is Far Eastern (the restaurant attached to the bar - Aqua Kyoto - serves up Japanese cuisine) and the crowd trendy: more locals in the know than tourists clutching guidebooks - or attempting a Monopoly pub crawl. There's not much on Oxford Street itself besides department stores and tourists, but options are plentiful in the surrounding streets. 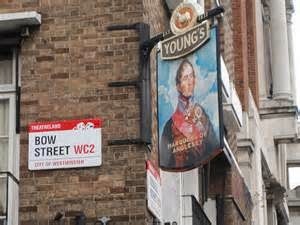 The Good Pub Guide recommends this "popular and unexpectedly individual" pub on Argyll Street, for its three interesting cubicle rooms, wooden partitions, impressive frosted and engraved glass, and a decent choice of real ales. Otherwise try The Social - set up by a small independent record label, it's great for craft beer and cocktails, and plays good music till late. Tucked just behind Bond Street Tube station on Davies Street – directly above The Running Horse pub – The Whip is a London bar that dreams of being anywhere but London. In its head, it exists in Louisville on a hot Saturday in May, watching the hooves fly as the Kentucky Derby takes place. The fantasy is abetted by the racing silks framed on the walls – and by the potent house mint julep, served up at £10 a go. The view from the top of the 101-metre-tall London Hilton on Park Lane is far better than the view of it. The Queen was reportedly furious at its construction 1963, but she would surely approve at the sight of London's twinkling lights from the confines of Galvin at Windows. Visitors will need deep pockets (as you'd expect from a purple property) - cocktails start at £15. There are other options at the hotel - Trader Vic’s, in the basement, is a Polynesian-themed bar and grill that does a mean Mai Tai, while Whisky Mist appeals to Sloanes and minor celebrities. Finish your epic bar crawl at any of the pubs on Shepherd Market - everyone spills out onto the streets after dark, lending this spot a real convivial feel. 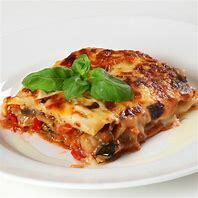 Our favourite is Ye Grapes - unpretentious and very un-Mayfair. Thanks to the Daily Telegraph.